Rain is lashing down on this grey and miserable day in June but as far as my taste buds are concerned it’s a gloriously hot summer’s day. I’m eating ripe English strawberries; the epitome of the British summer. Think of English strawberries and you’ll think of strawberries and cream, Wimbledon, Eton mess, strawberry jam. 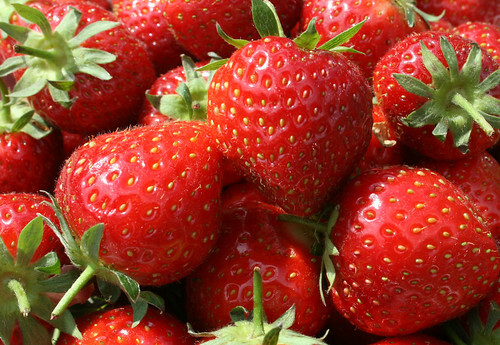 We may have a love-hate relationship with the British weather, but our climate is perfect for growing soft fruits and this is what makes our strawberries taste so good. Up there with asparagus, they put Britain on the culinary map. They are at their best when they come into season in June and through July, and they tell us summer has arrived – even if the weather doesn’t. 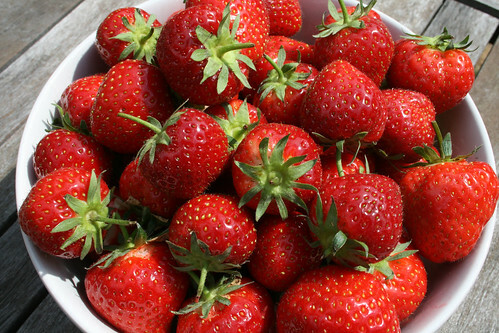 There are a few things you should not do to strawberries, to avoid spoiling their taste. As with mushrooms they should not be washed as they are porous and will absorb the water – so it’s best to buy organic – and they should be served at room temperature, not chilled. Most often you will see strawberries served with cream and sprinkled with sugar. I personally love them with thick clotted cream, or simply as they are so that I can pick them out of the bag or bowl and bite into their red juiciness. Oranges bring out their flavour, so orange liquor or orange flower water is good to sprinkle over them. As, perhaps surprisingly, is balsamic vinegar. Just a little though. I made the mistake of using too much when serving them to my family once and their screwed-up faces told me what words didn’t need to. They remain unconvinced to this day of how balsamic vinegar brings out the flavour of strawberries. But I have something that may change their minds. On the Borough Market Tour I attended a week ago we tried some white balsamic vinegar which was deliciously sweet, almost syrupy so. My first thought was that it would be perfect with strawberries and I wasn’t wrong. Use just a dash, along with a sprinkling of sugar, over the strawberries and leave them to marinade until you can’t smell the vinegar anymore. The taste is heavenly. Living in the region where the real Balsamic comes from, I'd like to say that strawberries with a few drops of REAL balsamic, 12 or even better 25 year old Aceto Balsamico Tradizionale made from cooked down fresh grape juice from Modena or Reggio Emilia: yesyesyes!! The Tradizionale is even better with wild strawberries, or pears. Strawberries with "Balsamic of Modena" is not the idea at all! White or brown this is just vinegar+sugar;it is caramelised sugar or sometimes just colouring that makes the vinegar brown, not reduction and long ageing as with the centuries old Tradizionale. Suggest you keep the sweetened almost pure vinegar/sugar Balsamics for your salads. Strawberries and balsamic vinegar? I’ll have to try that – I have done the same with blood oranges before, but not strawberries!! The strawberries look great, Julia. I’m very impressed with your use of the white balsamic with them. It’s just the sort of thing I do, resulting in my being known in college as Blumen Hestonthal. I shall try this myself, as soon as I can get my hands on some of that magic liquid. Cool, let me know what you think Jennifer and Trig. Just a dash though remember, otherwise it’s strawberries and vinegar! Bleugh. I love strawberries with Balsamic vinegar or syrup (I guess that is the same effect as adding sugar). They are also lovely with a grinding of black pepper over them and eat as is..
We are at the very end of strawberry season here but htose look lucious. I do like them with balsamic…or even a little gran marnier. I have not tried white balsamic vinegar yet – but I am going to get some after reading this! I came here thro’ the foodie blog roll.Cherries and berries are my all time favourites.your idea of using balsamic vinegar sounds great…gonna try it soon. I made this (and wrote about it) some weeks ago..if you’re Italian it’s not such a groundbreakingly original idea as they have been using Balsamic Vinegar for years with strawberries. The two flavours have a natural infinity and I am surprised that more people still don’t try it. Living in the region where the real Balsamic comes from, I’d like to say that strawberries with a few drops of REAL balsamic, 12 or even better 25 year old Aceto Balsamico Tradizionale made from cooked down fresh grape juice from Modena or Reggio Emilia: yesyesyes!! The Tradizionale is even better with wild strawberries, or pears. Strawberries with “Balsamic of Modena” is not the idea at all! White or brown this is just vinegar+sugar;it is caramelised sugar or sometimes just colouring that makes the vinegar brown, not reduction and long ageing as with the centuries old Tradizionale.